You don’t have to be great to start, but you have to start to be great. 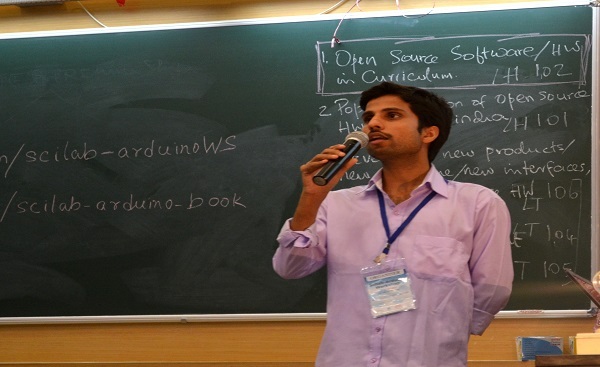 Sudhakar is pursuing Electronics & Communication engineering and shares his learning experience of internship days. Internship, Internship, and Internship! Entire campus at my university was buzzing with this word at the very beginning of fifth semester. The final year students of our department and the professors had been saying ‘look for a better place to intern’ at. Undoubtedly, all of us were apprehensive about the places where we would get an internship as it could work wonders or spell doom on our transformation from junior to senior undergraduate level. Having nurtured the habit of playing it safe, I had started applying for the internship(s) quite early; not only national but also internships abroad. While applying for the internships across seas, I over-leaped the internship opportunities in India. Consequently, I missed the deadlines of a few prestigious internships in India. However I was quite optimistic for my summer to be spent in another country. Unfortunately, none of my applications provided me with a moment to be on cloud nine. This resulted in an impasse and I reached a dead end since the overseas were gone and almost all of the esteemed Indian ones had expired. Now the blame game had started between my conscience and my confidence. All the hopes had started evanescing. The idea of interning abroad had already departed and now it was getting commuted with summer training at some company without financial aid. Nevertheless, things happen for good or better. The same was the case with me. All of a sudden, I came to know about Ekalavya Summer Internship at IIT Bombay. After an adequate googling of this program, I was able to discover the requisites and finally applied for the same. After a long wait, I was one of those 91 selected candidates out of 2492 students. Ultimately, I had earned an internship at India’s one of the best engineering schools. I joined the Ekalavya summer internship on May 21st. As per the project allocations, I was assigned to work in the Integrated Development Laboratory (IDL) in KReSIT building. In the lab, based on my interests and engineering background, my mentor Mr. Manas Ranjan Das (Research Assistant, IDL) instructed me to join a group of three other students. They were Paavni Shukla from BITS Pilani Goa, Sonal Singh and Tanmayee Joshi from VNIT Nagpur and CoE Pune respectively. We faced new challenges and found solutions with each passing day exploring Scilab and Arduino boards. The observations and findings were reported to our mentor and project manager Mr. Rajesh Kushalkar. After a fortnight, we met Mr. Samrudha Kelkar, who introduced us to MODBUS protocol and assigned us to manifest the same. After painstaking nights and days, we were able to implement the manifestation. It was Mr. Kelkar’s immense support and his phrases like ‘machaya’, ‘fight maro’ etc. that we never lost our hopes. Finally, in the early morning hours of June 11, we were fully prepared to demonstrate our implementation. The demonstration was to be performed before Prof. Kannan M. Moudgalya and Prof. Nirdosh K. Khosla. We presented our methodology and observations successfully (somehow). Later in the evening, Mr. Kelkar took us out for a pizza treat. This internship provided me with numerous mesmerizing experiences. In the short span of six weeks, IIT Bombay taught us how to love labs, explore and learn new things on our own. Apart from that, we also became authors of a book “Microcontrollers experiments through Arduino and Scilab” in the very early stage of our career. Along with this, we were able to draft a research paper. In addition to the enhancement of technical skills, we earned a lifetime experience by volunteering in the Scilab-Arduino workshop. Our demonstration was appreciated by the audience (including faculties and students). Last but not the least; I found good friends like Paavni, Sonal and Tanmayee. We have also got an opportunity to extend this work further in the coming December. During my stay, I hardly visited any place in Mumbai, for which I have no regrets. However, I could explore IIT B campus with the help of Siddharth who was once my junior at our alma mater and now a sophomore over there. Henceforth, I had no regrets for getting rejected at abroad internships. Moreover, I would try my best to join IIT Bombay for higher studies in order to contribute to the society. I remember very well the lines quoted by Mr. Kelkar that the experiments carried out in IIT Bombay affect the real world. I understood the meaning of ‘A bird in hand is worth two in the bush’. In our life, at numerous instances, we feel dejected because of failures and start the blame game. At that time, we forget that life snatches one opportunity to provide us a bigger and better one provided we keep our ears and eyes open. If Sudhakar’s experience motivates you, you can check the latest internships in Mumbai and Computer Science internships. Great Sudhakar ..miles to go..all the best for bright future. Thanks a lot, Shubham Sir! !